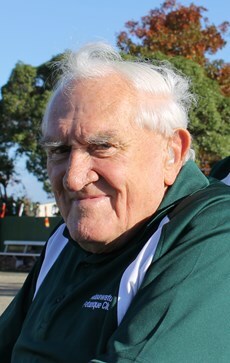 Manawatu Pétanque has lost their Foundation and Life Member Barrie Sinclair. Barrie along with his late wife Ngaere were instrumental in establishing Pétanque in Manawatu in the early 1990’s. Both Barrie and Ngaere were elected Life members in May 2009 in recognition for the service they had given to the Club over the past 10 years. Their contributions has enthused others to continue with our mission statement to promote Pétanque as a healthy, attractive, enjoyable, competitive sport with leisure and social activity to all members of the club. Eighteen teams (from fourteen clubs), including six from Wellington, are taking part in the National Club Championships at Rotorua (22-23 April). A preview in the Rotorua Daily Post. The video of the 2017 WPA Women’s Triples final (courtesy of Marc Khull) is now on the Wellington Pétanque YouTube channel. Eleven teams took part in the Women’s Doubles at the Manawatu Pétanque club. After the four qualifying rounds Yvonne Futcher/Annick Le Guen and Pauline Foxall/Trish Smart were the only undefeated teams. Yvonne and Annick won their semi-final, but Pauline and Trish were undone on time by Sharon Cannon and Sheryl Parslow. In the final, Sharon and Sheryl ended Yvonne and Annick’s winning run 13-7. The Plate was won by Christine Strichen/Claire Wilson over Beryl Cowan/Athena Christodoulaki. The Bowl final was won by Christine Daykin/Judith Smith over Pauline Ray/Louise Rose. 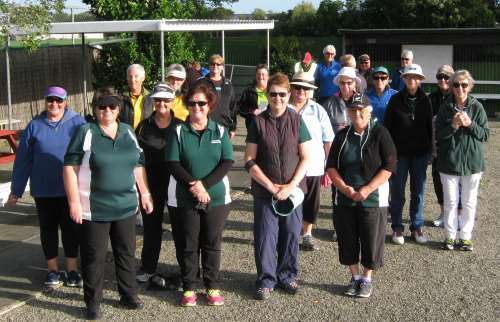 Eight teams took part in the Women’s Triples at the Manawatu Pétanque club. In the Trophy final, Sharon Cannon/Christine Strichen/Claire Wilson beat Ann Hogg/Shirley MacDonald/Sheryl Parslow 13-5. The Plate was won by Carleen Fitzgerald/Jan/Shirley Peard over Christine Daykin/Trish Smart/Judith Smith. Eighteen teams (from fourteen clubs) took part in the National Club Championships at Rotorua (22-23 April). Each team comprised 6 players in two Triples combinations. The first day was a five round Swiss, where Team A played the opposing team B, while Sunday was another five round Swiss with Team A playing Team A and B versus B. The two results were then added together to determine the overall winner. At the end of Saturday, Bay View and Herne Bay Green led the field with 8 wins from 10 games. Vikings, Wanganui East Blue and Panmure Pioneers were next on 7 wins. On Sunday, the lead changed several times as first one of the leaders then the other dropped a game to allow the chasing pack to close the gap. After three rounds, Bay View, Herne Bay Gren and Vikings were all on 36 points. Vikings won both round 4 games to take the lead. In the last round, Vikings played Bay View and Herne Bay Green played Masterton. Vikings quickly won the A game and then Herne Bay won both games to reach 45 points. It all came down to the Bay View-Vikings B game. After the regulation 60 minutes and 1 end, the scores were tied. An extra end was required. Vikings took the point with their last boule. However, Geoff Greer (Bay View) shot it out to win the game. Over to the computer (using the KickerTool program) to calculate the result. Bay View pipped Panmure on tie-break to claim Bronze. With a margin of 0.12, Herne Bay Green relegated Vikings to second place. Northcote Blue won the Senior team competition ahead of Kennedy Park. Twenty players have entered the Regional Women’s Singles at Otaki on Sunday, 30 April 2017.